There is no snow or muddy conditions on the Bowan Ranch Rd. Its been dry since the last major storm many weeks ago. There is the possibility of rain this weekend according to weather reports. 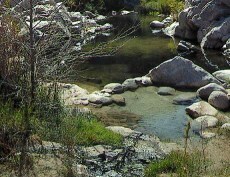 The creek is running higher due to snowmelt but it can be waded in front of the main pools. I talked to a regular a couple of days ago who went recently and said he waded across. Based on how high the creek was last week when I went to Deep Creek I would guess that you may have to go about waist deep wading across from the beach to the Crab Cooker pool area, if you hit the more shallow spots slightly down stream from the hotpools. It might even be lower than waist deep.